Catch & release fly fishing only! Late Winter Sea Run Cutthroat. Sometimes. Most of us have been enjoying winter fishing on Puget Sound this year. There has been enough mild weather to get some people out on the beaches, fishing between cold spells and storms all winter. Sometimes. February has a way of changing things in the winter. You begin to see the signs of days getting longer, a little more sunshine. And as the month progresses so many good things begin to happen that will set the stage for the season ahead. By mid to late February the chum salmon fry are working their way up out of their gravel redds, and by the end of the month and into March and April they are getting into the saltwater estuaries. Depending upon where you are, in south sound or north sound for instance, things get going in a slow progression, beginning in the south and moving north with the sun. South Puget Sound areas will generally see some chum fry getting out into the saltwaters a little sooner than the northern Puget Sound areas will. And the Cutthroat will be close behind. We do know that some Cutthroat spawn in late fall in some places. But little is known about what they do, or where they go, afterwards. Do they stay upriver all winter? Do they go back to the salt sooner? Do the males spawn again in the spring with the other spring spawners? What we do know is that all winter long people can catch some Cutthroat in the saltwater. Sometimes. So obviously there are some Cutthroat that are staying closer to the saltwater in the winter. We still don't know which ones we are seeing out there then,(as far as if they are early or late spawners etc.). With some of the new research programs being conducted around the region, we may have more information in the years ahead. It's an interesting thing to ponder. Research and field studies on these fish and their movements and behavior, life history and genetics etc., is not inexpensive. Here are some links to a few good projects. Here in the South Puget Sound the sea-run cutthroat fishery is one that many of our members hold dear to their hearts. This local treasure is a poster child for the potential of a sustainable catch and release fishery. However, there are still many potential threats to the health these great fish. The knowledge base of the cutthroat life cycle and habits is seriously lacking within the scientific community, and public knowledge is almost non-existent. Time and time again, history has proven one thing. What we don’t know, WILL hurt them. The SSFF is working in congruence with the WDFW and the Native Fish Society in gathering data on sea-run cutthroat in the South Sound. Members conduct spawning surveys, and are gearing up to collect scale samples in local watersheds to help with range identification. In coordination with the WDFW, the South Sound Fly Fishers have distributed and posted waterproof signs at fly shops and other sporting goods stores, along beach access points, and public boat ramps to help fishers identify sea-run cutthroat trout and remind them that they must be released. We will be recording catch data to help WDFW better understand the distribution of sea-run cutthroat in South Sound. The sea-run cutthroat is a truly unique fishery that with good catch and release practices and help from groups like SSFF we will be able to enjoy generation after generation." I am tying my spring flies now- Chum salmon fry, "Little Stone's Chum Baby", smaller baitfish, squid, shrimp, soft hackles, spiders, etc. I will use full sized herring and sandlance flies, up to four to six inches long, in the early spring. But by later April and through May there will be tons of very small herring around, and we will be using appropriately small and sparse juvenile herring flies by then. Flies as small as an inch or less, on size 12 to 14 hooks, will not be too small. You can barely tie them sparsely enough sometimes. Of course, as the season continues, we tie ever larger flies, to approximate the forage we are imitating, much of which is growing in size every day. But for now, even my Muddler flies will be uncommonly small. On the warmer sunny days in later winter and spring we like to fish the shallow edges of the beaches, especially on an incoming tide. There can be a lot of forage at the edges then, as the shallow water is gaining heat from the sun warmed gravel and sand beaches. Don't forget to bring along some amphipod imitations. A size 10-12 scud will do it, in grayish to olive colors. These "Beach Hoppers" can be found at the edges of the beach, underneath the surface of the sand, burrowed beneath the debris and tide wrack, and well hidden in rotting beach logs. They like damp dark places. They swim with frenetic jerks and wiggles, and trout love them. We sometimes see sea runs feeding on these amphipods at the edge of the beach, the trout with their backs and fins sticking out of the water. They are reckless about this feeding at times, you can walk right up to them. It reminds me of stream trout feeding on a "spinner fall." If it gets warm enough in the next few months, we can see some termites and winged beetles or ants getting out early from their slumbers. 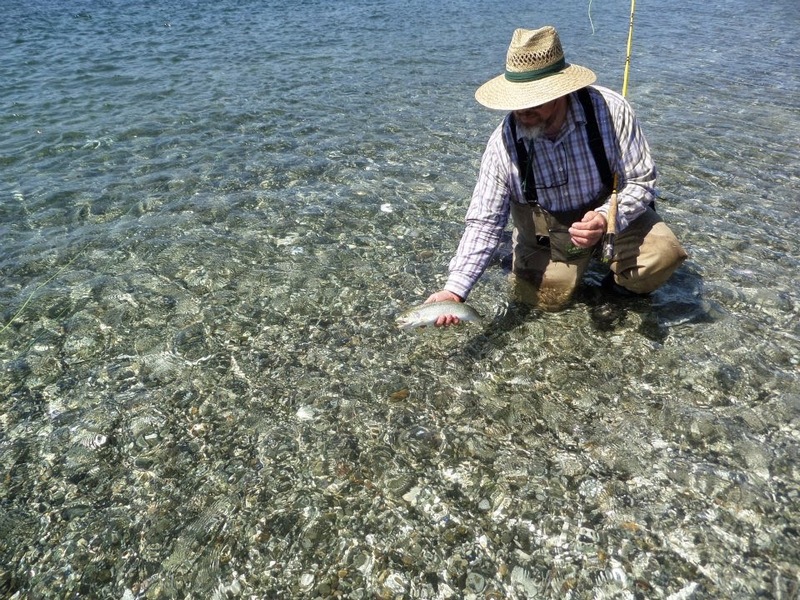 A few dry flies are a good thing to have any time that you are fishing for sea run Cutthroat on Puget Sound. We've made it this far, there's just a little more winter yet to come. But that's why we bought all of that expensive cool stuff to keep us warm and dry. We could use some rain and snow to rebuild our failed winter snow pack in the mountains. And there is still time to get slammed with a few good storms. But with each passing day and week ahead, there is an anticipation for those better days- Those days when things are so right, with balmy air and little wind, flat water and a moderate incoming tide, and the hungry Cutthroat are feeding right at our feet. Sometimes. I am guiding fly fishers on the Olympic Peninsula beaches, rivers and streams. 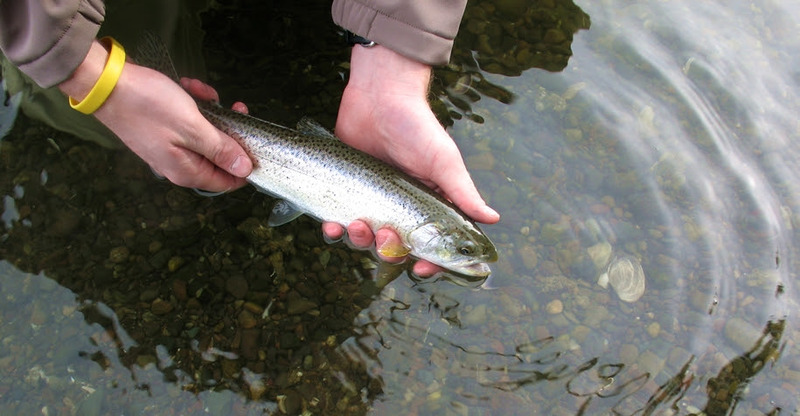 We walk and wade, fly fishing for sea-run Coastal Cutthroat trout in freshwater and saltwater, and in the rivers for trout and summer steelhead. This is strictly catch and release, traditional fly fishing only. Lunch, snacks, soft beverages, and use of some equipment is included. I also offer personalized and private fly fishing and fly casting instruction for beginners. I would be happy to help you plan your Olympic Peninsula fly fishing adventure, for beginners through expert anglers. Public presentations, Naturalist guide for rowboat picnics, Tide Pool and river trail day trips. Please call, write or email for booking details. Now booking for April and May!